Get more information on this topic for: Educators, Family Members, and Getting Involved. You can also search for more information in our Additional Resources section of the website. Finding friends is not always easy. If you have an intellectual disability it can take longer. But don’t worry–you can do it! You need to meet quite a few different people. After a while, if you work at your friendships, a few of them will become lasting friends. Others will remain people you know well enough to say “Hello” to. This section of the website gives you some steps to help you get started. 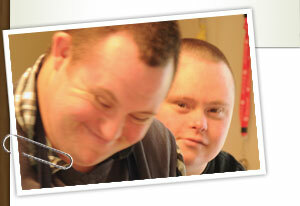 Jean-Marc and Harold met at a social club for people with disabilities. Jean-Marc is still in school. Harold is middle-aged. They love getting together even though they are different ages! They visit each other’s homes. They don’t talk much. That doesn’t matter. They share a love of music. Harold plays the harmonica. Jean-Marc plays the tam-tam. The music they make together is beautiful. They are sensitive to each other. They look at each other’s eyes when they play. This way they know when to play loudly or quietly. It helps them know when to bring their music to a close. This is a special friendship for both of them. One of the most important things you can do is know yourself. You need to know what you like. You need to know what you are interested in. You need to know your strengths–the qualities that can make you a good friend. You also need to know what supports you need, and where you can find these supports. Below is an Activity link that may help you think about your life. Ask a parent, support worker or teacher to help you fill out the pages. Kevin knows what he likes. He knows that he enjoys acting and music. He joined a drama and arts program at “La Fenetre” (The Window). They present plays and mimes. He also plays tam-tam with other musicians. This group has been a good way for him to meet new friends in his community. Completing this document may give you a better idea of what your interests and needs and strengths are. You may want to print it out. Ask someone who knows you well to help you. It may help you think about ways for you to make friends. 2) Think about what you learned from answering the “Getting Started” questions. What were some of the answers you came up with? Talk about these with someone who knows you well. What do these answers mean? Brainstorm about places you can go. Think about things you can do so you can meet people with the same interests as you. Think about what you are comfortable with too. Use some of the ideas you have come up with to make a plan. Perhaps, start with the idea of creating a Circle or Network of Friends. Some people have a Circle of Support or a Circle of Friends or a Support Network. This is a small group of people who support you to get to your goals. It is made of family and friends and maybe a teacher or another person. This includes your goal of having more friends, or other goals you may have. A group called PLAN has some good ideas about who should be in your Circle of Support. Someone who speaks up strongly for what you want. Someone who knows you very well—maybe a family member. Someone who knows your local neighbourhood and ways you could meet people there. Someone who is good at leading meetings. If your family member or support person would like to help you, they can find more information on creating a Circle or Network in Resources and in the Family Members section of this website. This is a guide that will help you think about building a good life in community. It is in plain language. Designed by the Individualized Funding Coalition of Ontario and funded by the Ontario Ministry of Community and Social Services.